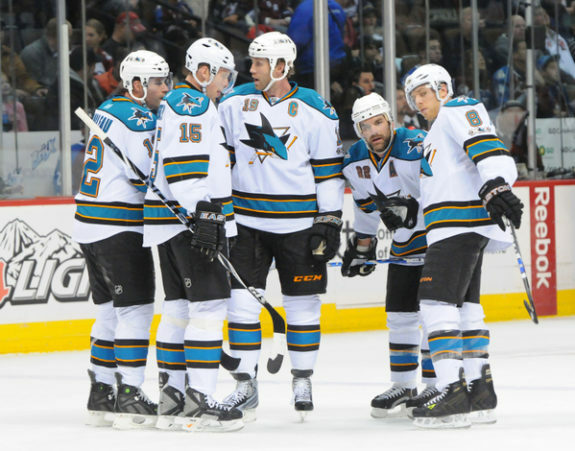 For the San Jose Sharks, this offseason is pivotal. They lost their all-time leading goal scorer to free agency. They’ve re-signed their all-time best player, despite being 38 years-old, coming off a down season and finishing it with two torn knee ligaments. He got 16% raise. The Sharks have made few moves. Though I question some, in the bigger picture, I think they are trying to do something they need to do. It’s a risky, but necessary path. I’ll cover this in the first part of the article. In the second part, I’ll switch gears and offer an update on the various moves made this offseason. The Sharks have a very good roster, with one exception. The role played by a younger, healthier Joe Thornton is now in the skates of an older, not as healthy Joe Thornton. 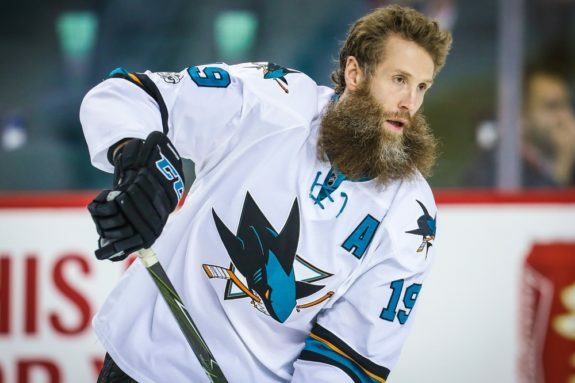 San Jose needs to fill the void created by Father Time’s pursuit. Historically, we’ve gone to the trade market. Look at Joe Thornton, look at Brent Burns, Martin Jones, Danny Boyle. We’re not afraid to go down that path, we have lots of cap space now and ultimately the cap space to acquire somebody when a key piece comes available and that’s really one of the things we do. And I think we’re in excess of $10 million in cap space. We get calls, you never know what the timeline is where you have a chance to improve your hockey team. Remember, if you’re going to give up those assets, it’s for a long-term piece that makes sense. While I’m hesitant to parse these words too finely, its clear Wilson is looking for a single major piece, not two or three pretty good pieces. The names he uses (Thornton, et al) are major pieces. He doesn’t say he’s looking to get key pieces (plural), he uses the singular “a key piece.” Even the timeline implies a major piece. Several good players have moved this offseason, where Wilson didn’t need to wait. Players who would make San Jose better. But ‘better’ isn’t the objective. Great is the objective. On this front, I’m all in. During the season, I wrote a pair of pieces on this theme. One suggesting Wilson trade only for a major ‘move the needle’ asset at the trade deadline and the second critical of the trade deadline deal for Jannik Hansen — not because of Hansen, per se, but because it wasn’t the sort of deal which moved the needle. I’d rather have kept the young, highly trade-able asset whose stock was rising as part of a very successful San Jose Barracuda team. Hansen didn’t change the team’s fortune, even if he is a respectable player. But he is a less trade-able asset than what the Sharks gave up. 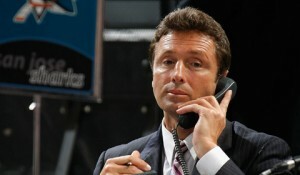 In order to pull off a deal for a major asset, the Sharks must make some savvy choices. Wilson has opened up the needed cap space. The second piece is more challenging; he needs assets the trading partner desires. This includes high draft picks, but also youthful talent. Here, Wilson missed an opportunity. Last season, I discussed the trade potential of Justin Braun. Opening up cap space was the immediate issue, but in the bigger picture, Braun represented a ‘sell-high’ opportunity. A quality defenseman gets a premium near the trade deadline. A quality defenseman with several more seasons on his deal at a ‘below market’ salary is worth even more. Based on valuations at the deadline, Braun could have garnered multiple first round draft picks. The Sharks would be wise to put their strong middle-tier players, solid prospects and draft picks together for a single elite piece, rather than parse them for multiple, lesser players. The Sharks should reserve their resources for the right opportunity. 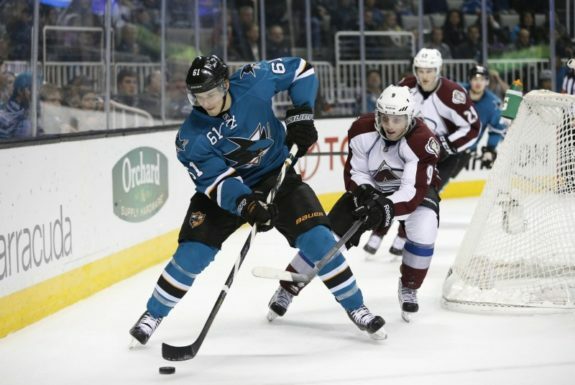 If the opportunity does not materialize soon, the Sharks should continue to wait. Toronto’s signing of Patrick Marleau has two potential silver linings, both relate to one player. Retaining Marleau would have eaten up a good amount of Sharks’ cap space for multiple years. For Toronto, Marleau’s deal means they’ll likely eat cap space for three, which makes it more difficult for Toronto to get in on the potential sweepstakes for John Tavares, and easier for San Jose. The Sharks kept Joe Thornton for a very rich $8 million, but only for a single season — this also plays into a Tavares scenario. 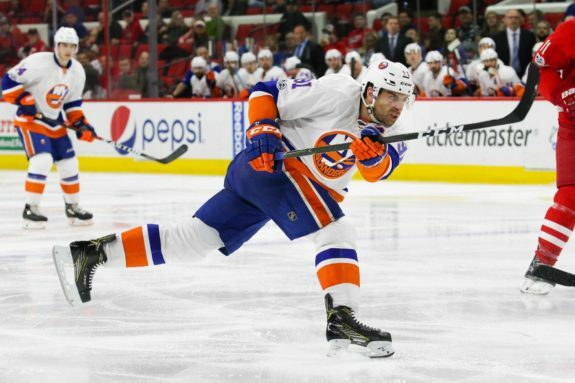 Tavares’ paycheck for the upcoming season is modest and the Sharks have cap room. Next season, it’s very possible Thornton takes a major pay decrease to open up cap room for a Tavares deal which could exceed $10 million annually (a side impact of the massive deal for Connor McDavid is a rise in salary expectations for other high-end players). I’ve said it previously and Wilson seems to agree – the Sharks are one player away from being a top Cup contender. For me, Tavares is that player. OK, perhaps not the only player, but certainly the best potentially available. So when a player like Tomas Tatar appears on the block or Marcus Johansson gets moved, keep in mind these aren’t the pieces Wilson needs. Yes, they are good players, tempting for certain, but not the game-changer who can bring a Stanley Cup to San Jose. Acquiring a Tatar or Johansson reduces the available cap space and requires San Jose to part with assets needed to land the bigger piece. With Tavares, there is no guarantee he ever change teams. Waiting for the right player, be it Tavares or someone else at a similar level, is a risk worth taking and therefore the right choice for San Jose. I’ll give a quick recap of players coming and going, and offer an opinion or two where I haven’t previously. The departures are more numerous and significant. We covered Marleau’s departure in a three-piece series. Other departed players include David Schlemko and Micheal Haley. Two notable departures are from the San Jose Barracuda — Buddy Robinson and Mirco Mueller. Mueller was traded, the right move for both team and player. Schlemko was selected by Vegas in the expansion draft, and while he is replaceable from within, the Sharks lost a good player on a good value contract. Buddy Robinson came to San Jose in the midseason Tommy Wingels trade. A big, effective forward with the San Jose Barracuda, he signed with the Winnipeg Jets. It’s unfortunate for San Jose, but he’ll have a better chance at making an NHL roster in Winnipeg. 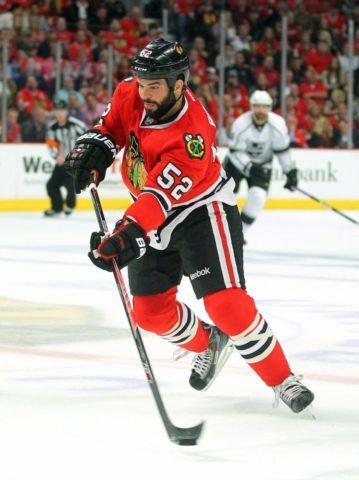 Haley’s departure and the arrival of Brandon Bollig a week later looks like an exchange of pugilists. While I’m not a fan of fighters, apparently the Sharks are. If the team wants a fighter, I’d have kept the popular Haley, who was not horrible last season. But when Haley left for Florida, it was predictable San Jose would replace his role. While some think Bollig will spend his time in the AHL, Sharks head coach Peter DeBoer is a fan of having a fighter in his lineup. A fighter (Haley or former Shark Mike Brown) has appeared in 70% of the regular season games during DeBoer’s tenure. The most important arrival, and the one with the toughest shoes to fill, is new assistant coach Rob Zettler. He replaces the departed Bob Boughner, who landed the head coaching job in Florida. Pretty much everything good about the Sharks last season came in Boughner’s areas of responsibility. Several Sharks have re-signed. 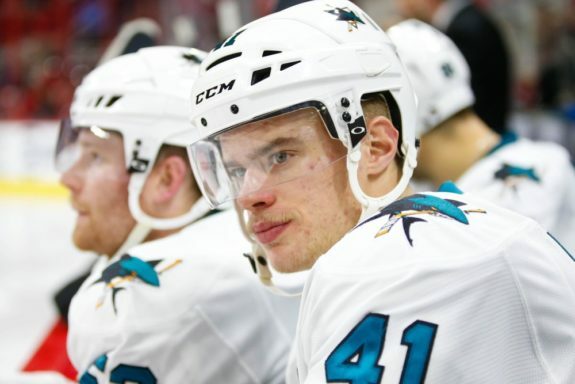 We covered major deals for Marc-Edouard Vlasic and Martin Jones. I also like the multi-year deals for Melker Karlsson and Joonas Donskoi. Chris Tierney is the latest to re-sign — he has a one year deal, which pleased my colleague Erik Johnsgard…I would have preferred to see a multiple year deal. A longer deal makes Tierney easier to trade (always a possibility). And though it would increase his salary cap figure this season, it would lower it for next season when cap issues are likely to get a lot tighter. Walking across the parking lot on the way to prospect game on July 6, I couldn’t help but notice the various player banners, each with the theme “Sharks For Life.” Its time to take down the Marleau banner.